Workers begin laying rails on Monday for the expected railway line connecting Beijing and Hebei province's Xiongan New Area. [Photo/Xinhua] BEIJING - Workers on Monday began laying tracks for the Beijing section of an intercity railway linking the capital with Xiongan New Area. The intercity railway line, set to be operational by 2020, will be an important link between the urban areas of Beijing, the Beijing new airport and Xiongan New Area. BEIJING, April 2 (Xinhua) -- China's centrally administered state-owned enterprises have taken the lead in building the Xiongan New Area over the past two years. On April 1, 2017, China announced plans to establish the Xiongan New Area, about 100 km southwest of Beijing, in what an official statement called "a strategy that will have lasting importance for the millennium to come and a significant national event." The following is a timeline of some key moments of centrally administered SOE participation in building the new area: -- On Feb. The two photos reveal that Xiongan New Area in north China’s Hebei province, has turned greener between 2017 to 2019. The man-made forests reached 133 square kilometers in 2019, with the forest coverage rate increasing to 11 percent. (The left photo is provided by China Xiongan Group Ecological Construction Co.
Photo taken on Jan. 17, 2019 shows an inner view of Xiongan citizen service center in Xiongan New Area, north China's Hebei Province. (Xinhua/Mu Yu) BEIJING, April 1 (Xinhua) -- After China unveiled the blueprints for Xiongan New Area two years ago, the "demo area" for the country's new development model has been under close scrutiny. 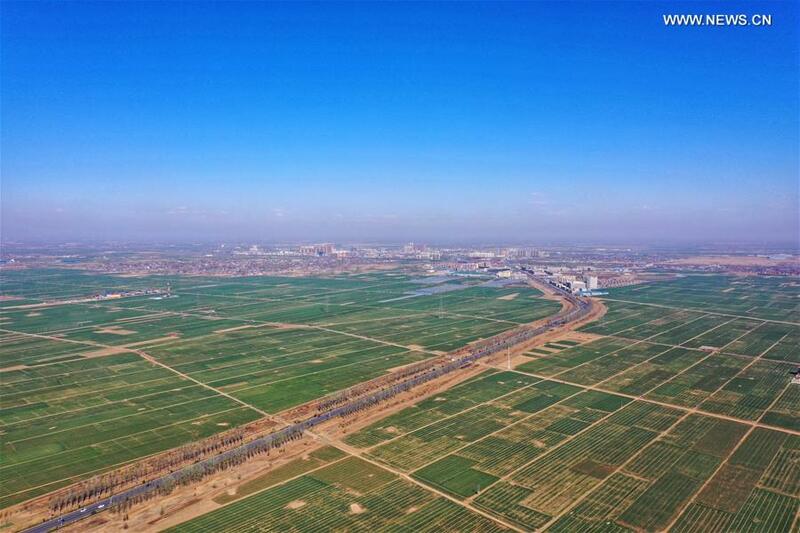 Aerial photo taken on March 31, 2019 shows the fields of Xiongan New Area, north China's Hebei Province. (Xinhua/Mu Yu) XIONGAN, Hebei Province, April 1 (Xinhua) -- China's Xiongan New Area, a millennium green city featuring innovative development in northern China, is to transform from being a just blueprint to a tangible reality starting this year. On April 1, 2017, China announced plans to establish Xiongan New Area, located about 100 kilometers southwest of Beijing, in what an official statement called "a strategy that will have lasting importance for the millennium to come and a significant national event. 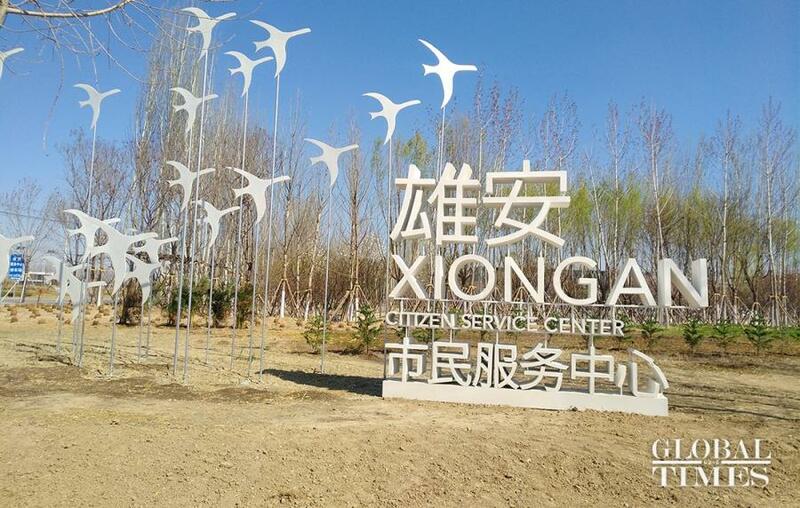 Improved public services among attractions as new zone's focus shifts to construction Wang Ning has worked in the Xiongan New Area, a new economic zone in North China, for nearly two years and expects to become a permanent Xiongan resident in the future. Wang, 35, considers herself a "Xiongpiao" - a term she created based on "Beipiao", a description of outsiders who live and work in Beijing but do not have permanent residency. The accountant at China Railway Xiongan Construction Co came to Xiongan in July 2017, three months after the new area was established in Hebei province. Two years have passed since China announced the establishment of Xiongan New Area in North China's Hebei Province on April 1, 2017. (Photos: Yang Kunyi/GT) Photo taken on Sunday shows the business office area and commercial street in Xiongan Citizen Service Center. (Photo: Yang Kunyi/GT) Photo taken on Sunday shows the business office area and commercial street in Xiongan Citizen Service Center. A photo taken by a drone shows a construction site of the railway connecting Beijing and Xiongan New Area, Hebei province, on March 20. [Photo/Xinhua] Companies upbeat on 2-year-old new area as goals in place for development Xiongan New Area, which was first announced two years ago, has been attracting increasing attention from foreign companies given its huge development potential. Located about 100 kilometers southwest of Beijing, Xiongan is aiming to become a significant part of the Beijing-Tianjin-Hebei cluster, and plans to take over Beijing's noncapital functions and provide a Chinese solution to "big city malaise", including overcrowding, pollution and traffic congestion. BEIJING, March 5 (Xinhua) -- The Xiongan New Area in north China's Hebei Province will start large-scale substantial construction as the top design of the area has been completed, vice governor of the province Chen Gang said Tuesday. More than 200 teams and 1,000 experts from China and abroad have participated in the plan making, Chen said at the first "passage interview" of the second session of the 13th National People's Congress that opened Tuesday. In April 2017, China announced the establishment of Xiongan New Area about 100 km southwest of Beijing. An aerial view of Xiongan New Area. (Photo/Xinhua) As the water diversion project is in full swing in Xiongan, North China's Hebei province, Li Qingshan, who is responsible for the project, makes no secret of his pride. The project, taking water from China's Yellow River to Baiyangdian Lake, the largest in the province, is one of the first to be carried out since the central authorities announced the establishment of Xiongan New Area in April 2017.